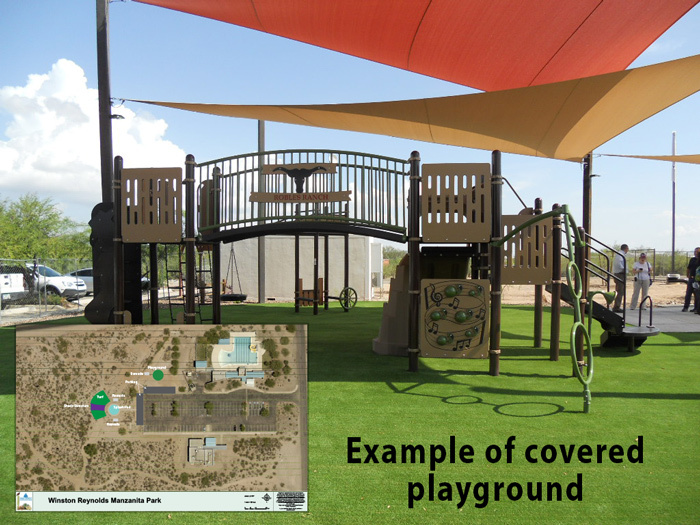 Pima County Parklands Foundation is seeking donations totaling $100,000 to provide new covered playground equipment for Winston Reynolds-Manzanita Park. Located on Tucson's southwest side, Manzanita Park is one of Pima County's most heavily used facilities. It provides the only public swimming pool in the entire southwest side. Through a variety of funding sources, Pima County Natural Resources, Parks and Recreation is investing $684,000 to upgrade the park's facilities with a new splash pad. The additional funds Parklands is seeking will add a modern covered playground complex, adjacent to the splash pad and ramada, for children between the ages of 5 and 12.